Paul Revere. Boston, Massachusetts 1735-1818 Boston, Massachusetts. 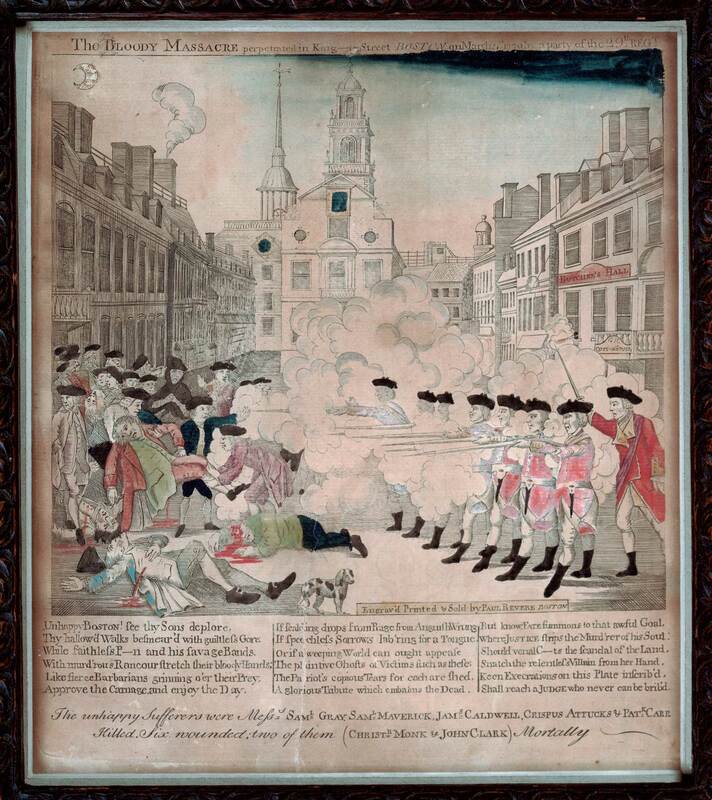 The Bloody Massacre perpetrated in King Street Boston on March 5th 1770, by a party of the 29thRegt., 1770. Hand-colored engraving, 10 ½ x 9 1/8 in. Gift of Mr. and Mrs. Robert Saltonstall, 1972. Paul Revere’s famous engraving The Bloody Massacre, more frequently referred to as the Boston Massacre, is a work that sheds much light on how Revere combined his entrepreneurial skills with his patriotic fervor. He was a businessman, a family man with many children, and a patriot. He was also an engraver; but he was not one who created original works. Instead, he engraved works whose genesis came from the ideas of others. His Bloody Massacre,while clearly one of his best-known prints, had its beginning in the mind of Henry Pelham (1749-1806), an artist, engraver, and half-brother of the painter John Singleton Copley (1738-1815). It appears that Pelham engraved his own version of the Massacre and lent Revere some version of it, from which Revere made his engraving, adding at the top his title and at the bottom a heroic couplet and the names of those killed or who were expected to die. He advertised the sale of the prints on March 26, 1770, three weeks after the Massacre and a week before Henry Pelham began selling copies of his own version. On March 29 Pelham wrote to Revere accusing him of acting dishonorably and taking credit for work Pelham himself had done. We do not know if Pelham ever sent the letter, but it is clear that he felt Revere had taken an unpublished work and, without permission, made the engraving and sold copies under his own name. Pelham advertised the sale of his engraving, The Fruits of Arbitrary Power, or the Bloody Massacre, on April 2, 1770, one week after Revere had advertised his. As a piece of propaganda, The Bloody Massacre was designed to elevate a tragic incident into a politically motivated calamity and agitate the colonists’ negative view of the British occupation of Boston. Colonists had already been subjected to various taxation laws passed by the British Parliament to cover the costs of the French and Indian War and to help defray the costs of the ongoing security that the British continued to provide for the colonies. The Boston citizenry had been an irritant to the British Government and as the radical element became more vocal, Britain sent troops to occupy Boston in 1768. Tensions mounted quickly, and confrontations between the citizens and the soldiers increased dramatically over the next several years. The eventual result, in 1770, was the Boston Massacre. Both Revere and Pelham portray an unarmed group of slightly more than twenty citizens who are fired upon at close range by seven British soldiers under the command of Captain Thomas Preston, who is shown ordering his men to fire their weapons. The soldiers are lined up in front of the Customs House and are depicted shooting directly into a crowd of citizens. In his version, Revere added the name “Butcher’s Hall” to the front of the Customs House to make clear his own opinion of the event. Although one of the first people killed in the Massacre was Crispus Attucks, who was of African and Native American descent, no one who fits that description appears in any contemporary print of the incident. The earliest known depiction of Crispus Attucks as a person of color participating in the Boston Massacre is in an 1855 drawing by William L. Champney (fl. 1850-1857), which J. H. Bufford made into the chromolithograph Boston Massacre, March 5th 1770. Image above: William L. Champney. (fl. 1850-1857). Boston Massacre, March 5th, 1770. Boston, Published by Henry Q. Smith, 1856. Chromolithograph, 17 ¾ x 24 in. Tom Gearty from, Stanley Ellis Cushing and David B. Dearinger, eds., Acquired Tastes: 200 Years of Collecting for the Boston Athenæum(2006): 296-298. Copyright © The Boston Athenæum.